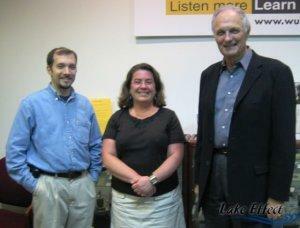 Lake Effect's Bonnie North interviews Alan Alda about his second book. Celebrated actor Alan Alda was in Milwaukee last month to read from his new book, Things I Overheard While Talking to Myself. He spoke with Bonnie North. Alan Alda: "Never Have Your Dog Stuffed"
Alan Alda first rose to fame as Hawkeye Pierce on the TV show, "M*A*S*H*". He also hosted "Scientific American Frontiers" on PBS, and more recently starred as Senator Arnold Vinnick on the NBC drama, "The West Wing". Alda has also acted and written for the silver screen and for the stage. He was in Milwaukee to speak at Alverno College as part of a series sponsored by Schwartz Bookshops. His book, "Never Have Your Dog Stuffed", has just been released in paperback.